Pass your NEBOSH exams with flying colours, using this handy guide. A quick look at the examiner’s comments from past NEBOSH exams reveals that delegates frequently fail to answer the question as it is set. 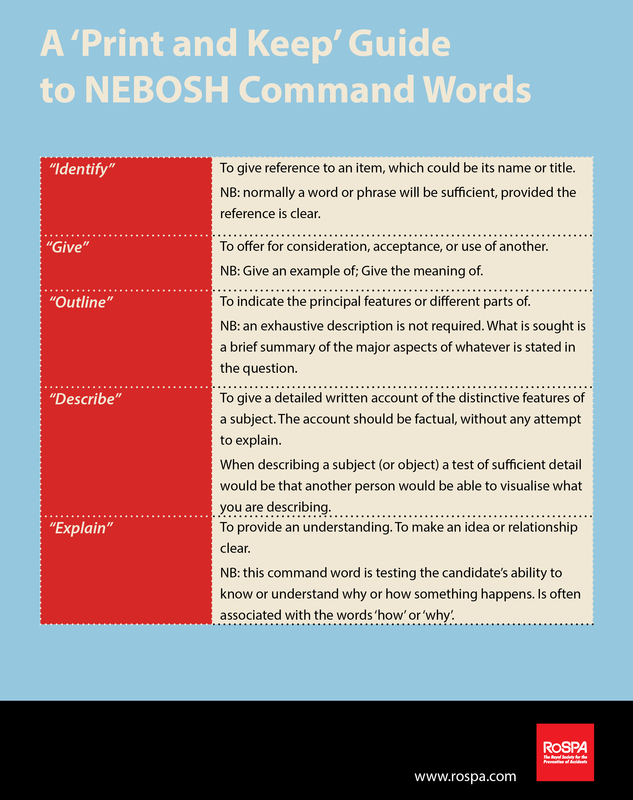 To help ensure that delegates on my NEBOSH Certificate, and NEBOSH Revision courses, avoid this common pitfall I’ve put together this handy NEBOSH exam command word guide. I hope that it can help you too, so please print it off, like it and share it. If you’ve found this useful you may also be interested in our very popular series of NEBOSH question and answers: How to craft killer answers and excel in NEBOSH exams – Part 1 and How to craft killer answers and excel in NEBOSH exams – Part 2. There are also these NEBOSH exam top-tips from Roxanne, a recent NEBOSH Certificate candidate. RoSPA have produced a FREE NEBOSH ebook providing tips and advice for maximum success! Sign up to SafetyMatters newsletter to receive your copy. Follow RoSPA’s brand new Twitter feed dedicated to workplace safety, @RoSPAWorkplace for all the latest NEBOSH revision guides, hints and tips!